This project shows you how you can make a dog rain coat by reusing an old coat. Measure your dog: In order to get the right size of jacket to make your dog’s coat you will need to take a few measurements first. Neck to Tail: Start your neck measurement at the base of the head and measure to where the tail begins. Mid front leg to Mid front leg: Take this measurement with a flexible tape measure and go from mid front leg over the back of your dog to the other mid front leg. Body Circumference: Use a flexible measuring tape and wrap it around your dog’s body just behind the front legs. Neck of Coat to Bottom of Coat: This measurement should be the same as your "Neck to Tail" measurement. 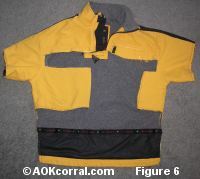 If it is a bit too long, that is OK, you can shorten it by shortening the coat before you begin. Mid Arm to Mid Arm: Turn the coat so the back is facing up and spread the arms out. Make sure that your "Mid front leg to Mid front leg" measurement will fit across the back of the coat and partway into the arms. Circumference of Coat: Lay the coat out on a flat surface and measure from the front edge of one side of the coat across the back and to the front edge of the other side of the coat. This measurement should be larger than your "Body Circumference" measurement by at least 4 inches. 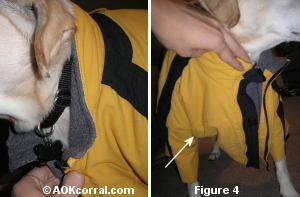 Once you have picked out a coat, make sure to lay it over your dog and double check the measurements. 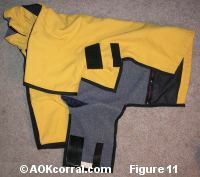 See that the front will fit around your dog’s body, that the arms will go to at least the mid front leg, and that the coat is long enough to go from the dog’s neck to the dog’s tail. Lay the coat out on a flat surface, front side down and arms outstretched. Divide the measurement for "Mid front leg to mid front leg" in half. Repeat for the other side. You should now be able to measure across the back of the coat with arms outstretched and it should be the same as your "Mid front leg to mid front leg" measurement. Put the coat on your dog and put his front legs through the arms of the coat. Make sure the coat is centered on her back. Now, you will be making marks under the dog’s front legs for some cutting lines. Take one of the front sides of the coat and hold it up against the dog just under and between her front legs. (There will most likely be too much coat but try to flatten it out near her leg as much as you can.) Make two marks on the front of the coat near her leg, one toward the front of her leg and one toward the back of her leg. Do the same with the other side of the coat. Take the coat off your dog again and lay it out on a flat surface with the front of the coat facing up. Do the same thing with the other side. If the coat you have chosen has more than one layer of fabric (most of them will), you will want to sew the layers together along all of the raw cut edges. Pin through all layers of fabric along all the raw cut edges. Stitch ¼ inch from the raw edges. Remove pins. 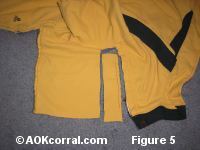 Stitch through all thicknesses of bias tape and coat to finish edges. 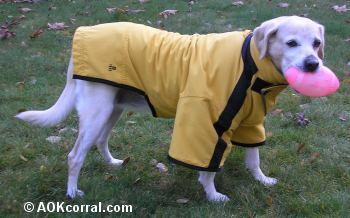 Put the coat onto your dog once again and adjust to make sure that it is in the correct position to fit comfortably. 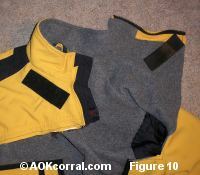 Make marks on both sides of the coat to indicate where you will need Velcro connections to hold it in place. Keep your dog dry and warm on those wet and cold walks! Do you love dogs? Try our Stuffed Dog with Coat Pattern!